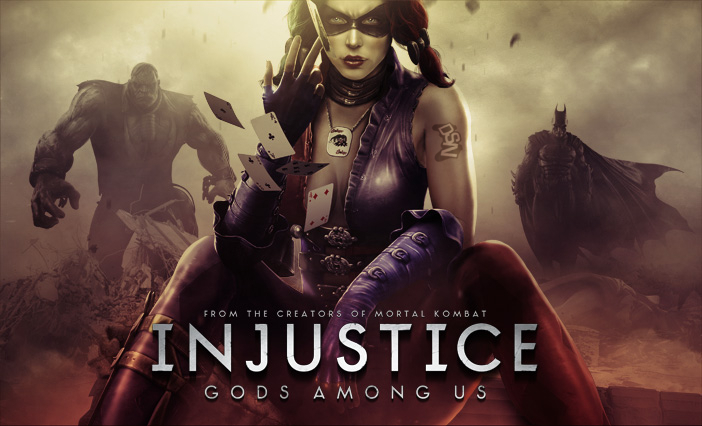 The Official Injustice Page has the full list of changes, and there are lots of them! What does all of this mean? Try though we may, we can’t say for sure how much the meek will be embiggened because patch notes in a vacuum don’t mean much of anything. In the coming weeks, perhaps we’ll see fewer people employing the mightiest Kryptonian and more people riding in on their space motorbikes,half-burnt cigar hanging from their lips; fewer people chucking magical lightning bolts and more people employing the game’s only trait-based parry. Or, perhaps these changes will do what balance patches should do: make the playing field more even for every character, in which case we may not see much change in character popularity at all. Don’t forget that just because your character didn’t receive a drastic increase in power, your worst matchup may have received a drastic decrease in power, which works just as well in your favor. I’m personally glad to see Supes lose some of his zoning ability, though the notes are vague about just how much recovery his eye beams gained in this tweak. To see some of these changes in action, check out the archived NRS footage from last night’s Twitch stream! Don’t forget to check back Friday for part two of my SL1 Dark Souls play through! It promises to be even more absurd that the first! I spent all of last weekend with @MostlyAdequate, a good pal of mine who flew in to see The Protomen (twice!) in my area. When we weren’t seeing their shows and consuming copious amount of adult beverages, we were pouring tons of time into every fighting game that we could before he had to make his aerial trek back home in his cloud car. RaspingBike joined the mix and we did our best to figure out just how well my setup can capture live commentary. This involved lots of volume level tweaking and a huddling of three dudes around a central headset which was precariously perched in front of us. The matches we fought were markedly more numerous than they were serious; We were just trying to have a good time and enjoy some conversation while pummeling each other. The focus for this video, then, is actually the audio. This particular chunk weighed in barely shy of the two hour mark and I whittled it down to just over ten minutes. It’s an comedy-packed guff fest filled with talk of comics, movies and all sorts of other things and is positively loaded with NSFW language. The footage comes exclusively from Injustice: Gods Among Us, but we captured equal-length recordings from Street Fighter IV, Persona 4 Arena and Skullgirls. that still require necessary edits in order to be consumable. The outcome of this video, as well as the other bits that we recorded over the weekend, has given me the confidence that my setup can handle this type of thing and produce quality results. Nothing is quite yet perfect, but everything looks and sounds very good. I hope you enjoy the video and be sure to check back Friday for some of my ranked SF IV matches with commentary from the three of us! 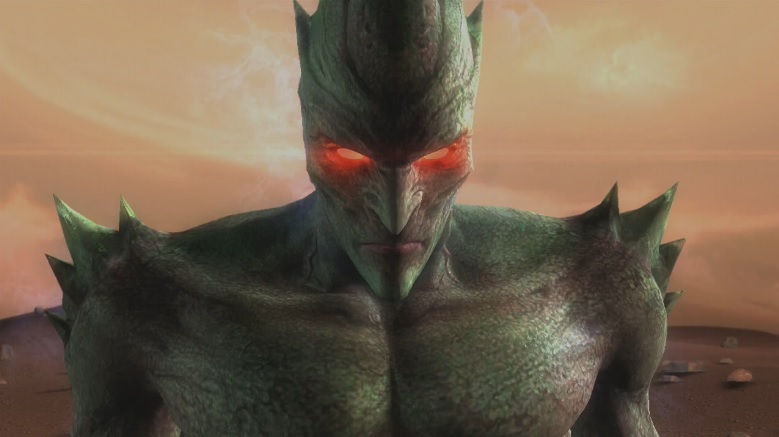 Earlier this week, NetherRealm Studios made their fifth DLC addition to the Injustice roster: Martian Manhunter. An original founder of the Justice League, J’onn J’onzz pounds his stretchy palms into the heads of evil-doers in hopes to win next years Evo (c’mon , even heroes like to win!). He makes use of eye beams, Dhalsim-style limbs, telepathy and teleportation, affording him a wide array of combat options. I decided to pick him up last night and get some training matches in after a quick look at some of the various videos that have been released this week showing how to effectively use him. Featured in the following video are four matches, all with Martian Manhunter. These certainly aren’t high level matches, but they do give a good idea of how the character approaches different aspects of the game. I play as Manhunter against RaspingBike, who is currently learning Shazam, in the first three matches. The final match shows a very different approach to J’onn as Dragon Rising II takes control of him against my decent-enough Flash. He feels like a good character. He has a lot of options from a lot of ranges. I’d say, though, that he finds the most comfort at either full screen, where he can zone with three different projectiles, or right on top of his opponent, where he can run a decent mixup game and has some pretty sweet reset potential off of some of his strings. Mid range seems to be the area to avoid–somewhere just outside of the range of most of his normals–as he gets blown up with ease. His projectiles activate too slowly to be of any help and his limbs just can’t reach from there. His trait isn’t particularly interesting, but it does activate instantly and can be activated while being hit, while blocking, while jumping, while doing a combo or while enjoying a nice cup of coffee atop Gotham’s highest skyscraper… ahem… Anyway, his trait helps him out by increasing his damage output slightly and altering the ranges of his normal attacks. This increases his effective range to more of an acceptable “mid range,” and allows him to perform some tricky combo openers, like his Back + 2 to catch unwary opponents off their guard. After a few hours of casual matches, I can say that I had a really good time playing Martian Manhunter and will likely continue to learn him as a secondary or tertiary character. He has a very adaptive playstyle and can control space in a very interesting manner with the various tools at his disposal. These tools do have a pretty steep learning curve, though, and zoning with him looks like it may take a great deal of patience and knowledge of which projectile to throw, when to throw it and exactly where on the screen to throw it, but such technical endeavors certainly do make things exciting! After CD Jr, I had to fight a second Superman. Of course, he wasn’t nearly as good, but I’m genuinely bad at fighting Superman anyway and I was still pretty shaken, having just fought and lost to a player who consistently finishes with high placement in majors. So I landed a few convincing combos and got the second guy to his second bar both matches, but ultimately lost. Two and out in Injustice. Oh well. My quick elimination from the Injustice pools, wasn’t necesarily a bad thing, as it allowed me to spend the rest of the day running around Vegas doing Vegas things. My buddies and I went and got some food at Hash House A Go Go, which I now rank as one of the most ridiculous places that I’ve ever eaten. They serve two inch thick pancakes that shamelessly sprawl across entire platters and offer up filling like fresh banana or Snickers candy bars. Yes, you can get a giant pancake with candy cooked right into it. I, however, had to get the bone-in chicken and waffles. They came out stacked at least a foot tall with a steak knife run through them like Excalibur, which means I must now be the King of Wafflesburgh, because not only did I effortlessly remove the sacred blade from its eternal holding place, but I also demolished everything around it. And it was delicious. The rest of the evening was filled with plastic footballs full of various adult beverages, PBR tallboys and video poker, not with any intent to win money, but plenty of intent to imbibe free beverages and maybe recover what we spent on tips in the process. We saw the Fremont Light Show, which happens nightly and fills the air with 80’s music as the mile long canopy over the street lights up with animated clip art and other outdated graphics. I had seen it before several years ago and thought that maybe they would have upgraded it a bit by now, but they didn’t. The light show really serves as nothing more than a means of distracting the rest of the Fremont-goers, as they all crane their heads upward like ducks in the rain, fully prepared to drown in poor graphics. The morning of day three passed without consequence. We slept incredibly late to allow the liquor to work its way out of our systems and eventually found ourselves at the famous El Cortez for coffee and a slice of pie. From there, I boarded the bus and made the slow trek back to Bally’s to catch the Street Fighter top 8. On the bus, my phone was blowing up. Every couple minutes a different person texted me asking if I was at the Marvel finals. “Dude, are you seeing this?” No, I wasn’t, but I was watching Twitter, where James Chen and Ultradavid spoke about how the Marvel finals were some of the most ridiculous play they’d ever seen. They were talking about getting emotional; they were talking about people cheering for Justin–a stark contrast the days of Marvel 2. I hadn’t expected Marvel to be that hype; I have no justification for why, but I don’t typically watch a lot of Marvel, so this seemed like something that I could miss without much worry. How wrong I was. New characters, new stages and a complete balance overhaul based on fan feedback. I knew that the update was coming, but I didn’t expect it to add quite so much as it does. As the video ended, I took a seat in the back of the ballroom with Menno and Tim, who had come to watch the finals with me. The finals were a blur of emotion. Certain moments stand out above others: PR Rog’s amazing, almost disrespectful use of focus attacks on Haitani; Infiltration switching to Hakan to take out PR Rog; Sako’s ridiculous ability to land tsumuji loops on every hit confirm; Infiltration and Tokido’s Akuma mirror causing the entire audience to yell along as Akuma shot air hadokens; When you’re experiencing something like this for the first time, it’s easy to get lost. It’s easy to forget exactly who fought whom and who won. Immediately after the event, I couldn’t have told you anything that I had just witnessed. I was completely overwhelmed. I did know, though, that Xian ended up winning. I also knew that I was glad that he won. I am still glad that he won. I’m glad that Street Fighter is balanced to a point that one of the most average characters in the roster can win the biggest tournament in the world. I can’t wait to see what next year’s top eight looks like with all of the balance changes that are coming. My early prediction? At least one Chun-Li in the top 8. Prior to Evolution 2013, the largest fighting game tournament that I had attended was held at a local Game Stop to commemorate the release of Street Fighter X Tekken. The tournament ran two setups which were placed atop a single shaky table directly in front of the store’s entrance. Patrons had to shimmy around us to enter the store. There were no chairs, so we just sat directly on the floor with necks craned up toward the TVs, one of which was incredibly laggy since we didn’t have a second HDMI cable. There were only about ten entrants and we all had a few week two combos, but none of us had truly grasped the game’s engine yet so our matches were mostly bland and filled with abuse of tactics that people weren’t used to blocking. In the case of the laggy TV, massive volleys of projectiles, for example, proved quite difficult to avoid. The first place prize was a guide for the game, second place was a Madcatz fightpad and third place was a hearty hand shake. I think I got fifth place, so I was simply asked to exit the establishment. Three years ago, when I gained a revitalized interest in the FGC, I watched the Evo streams for the first time. If you had told me then that I would not only soon attend the tournament, but also compete, I would have thought you crazy, but last Thursday evening a small group of friends and I stepped off our plane and onto the neon-lit streets of Las Vegas to do just that. I was there to compete; they came as supporters. Our three hour flight, which was packed to the point of bursting with eager Vegas-goers who somehow managed to drink all of the booze on the plane, arrived just after dark. We caught a cab to Fremont, checked in to our rooms and wasted no time getting down Binion’s for some diner food and fifty ounce plastic footballs filled with beer. I made sure only to enjoy a single footballful evening, as I didn’t come to Vegas to drink, well, okay, I didn’t go to Vegas exclusively to drink. I came to fight, and the fighting started early the next morning. My pools for Street Fighter began at noon Friday morning, so I set an alarm way too early–something to the effect of 8:15–so that I wouldn’t have to rush. I intended to wake up, grab a coffee and some sort of moderately-healthy breakfast food item, then show up in time to find a setup and get in some casuals to work out the pre-tourney jitters before my pool was slated to begin. It was a pretty good plan, but I really love hitting the snooze button and ended up sleeping until around 10:30, which left me just enough time to inhale a protein bar and a soda, rush outside the hotel, eight arc in hand, hail a cab and sit biting my nails for the 20 minute ride to Bally’s from The Plaza, certain that I would be disqualified for being late, as I hadn’t even picked up my pass yet. 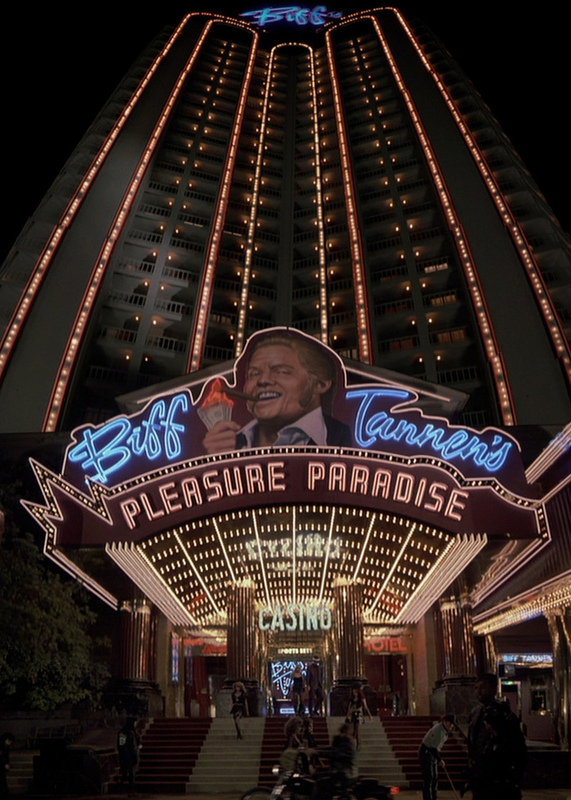 With just over an hour remaining before pools, I made my way into Bally’s. A line of people, probably fifty feet in length, snaked out of a tiny, roped-off room. The room was filled with tables stacked high with black t-shirts and blue badges. I knew that I’d have to wait in the line before I could enter the venue, so I accepted my fate and checked the time every minute or so, convinced that I’d not make it to my pool in time. Then the line started moving. I talked with some of the guys that were around me and they were all there for different reasons, one for Smash, a couple for Street Fighter, another only to watch and as we talked, the line melted in front of us; after only ten minutes of waiting, we all went our separate ways and I heaved a sign of relief because I still had over half an hour to figure out where pool C15 was. The Game Stop experience in mind, you can imagine my amazement when I slipped my competitor badge around my neck and walked into the grand ballroom at Bally’s. Everywhere I looked there were small groups of players huddled closely around lagless Asus monitors as though the glow emitted by their flat screens was the only thing keeping them alive. To my left stretched an impressive food cart offering vastly overpriced burgers, chicken fingers and sodas and towering to my right loomed a massive projector screen upon which Chun-Li and Ryu fought for dominance in front of an erupting volcano. Each successful strike landed by Chun-Li drew a grunt of pain from Ryu and a cheer or gasp from the crowd. I couldn’t turn my head without catching sight of some influential individual in the fighting game scene: Ed Boon brushed by me at a rapid pace on his way to the overflow room; Yipes leaned against a nearby wall and regaled a small group with tales of Marvels long past; Justin Wong stood, arms crossed as he watched pools just a few feet away; Yoshinori Ono snapped pictures of the event and held aloft his famous Blanka figurine in greeting to any who offered him a hello; I was, quite literally, surrounded on all sides by fighting game greatness. I made my way to my station 15 where my pool (c15) was to be held and tried to get an idea of what kind of opponents I should anticipate. There were a lot of Onis, like… a whole lot of Onis. Every other match was Oni vs. someone. 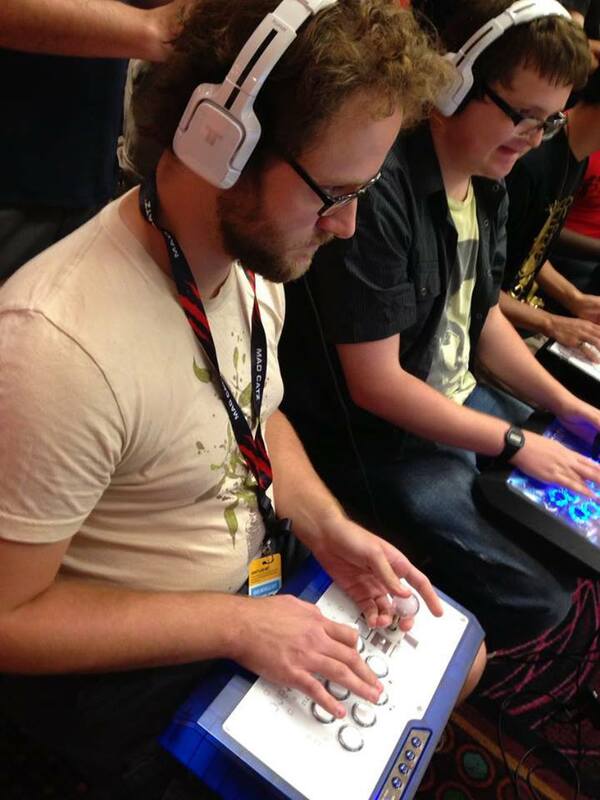 I have fought him plenty of times in the past, but I had no idea that he would have such a presence in pools. I sort of thought people had gotten over him by now, but apparently not. I watched another Ibuki, tons of Ryus, a Zangief and a particularly impressive, dirty-fighting Vega. They were all good. My brow began to bead with sweat. I was nervous. I knew that I would be. I hadn’t anticipated just how nervous, though. When I took my seat and pulled on my headset, my hands visibly shook as a small crowd gathered directly behind me. Though it was only a handful of people, many of whom I knew personally, they were standing less than an arm’s length away from me as I plugged my borrowed stick into the Playstation. I nervously drummed the stick’s buttons as I began the most important button check I’d ever done. A quick slap of each of the six buttons, a glance at the button config menu, another slap of the six buttons and an obligatory combo with the character played before me to be sure that everything was as it should be, a quick nod and thumbs up to my opponent and it was back to the character select screen. As his cursor slid over Chun, I felt a bit uneasy. I have played as Chun extensively myself and have a decent grasp of the matchup, but I would have rather started somewhere more familiar, y’know, a Ryu or something. I don’t believe either party to be at an advantage in the Chun – Ibuki matchup, but Chun is one of those characters who, when she has meter, can escape every vortex setup for free (ex spinning bird kick), so I have to play a different game against her, which is exactly what I didn’t want to have to do in the first round. I dropped combos. I botched setups. I dashed away from kikokens when my back was to the wall, allowing them to slam into my chest. I mistimed jump-ins, whiffed kunai and wasted meter… and I took the set 4-0–a commanding victory. My nerves were shot, but such a convincing win, however ugly it may have been, boosted my spirits. I GG’d my opponent, unplugged my stick and shook the hands of everyone around me. I even got a couple of victory hugs. Suddenly the crowd felt a little less imposing. They were there to see a good fight and my opponent and I had done our best to deliver that to them. They were pleased with our performance and I moved on to my next fight: A Ryu, just what I thought I wanted. The Ryu had been to Evo four times, he claimed. And it showed. He knew that I was nervous and he played me accordingly. I attempted to do some variant on the Gootecks shuffle to open him up, but eventually just ended up eating shoryuken after raw shoruken. I put in some work, but my jitters still weren’t gone and playing against someone who was 100% jitter-free certainly didn’t help my chances for success. Ryu came out on top, placing me in losers against a Honda player who was equally ready to fight against nervous first-timers. He had an answer for everything that I threw at him, kunai included. Upon elimination, my friends and I went back to our rooms and drank heartily in celebration of the fact that I actually managed to send someone else to losers before going there myself. Some hours later, filled with beer thirsty for more Street Fighter, my buddy Menno–who let me use his stick since mine only works for Xbox, thanks again!–and I made our way back down to Bally’s to check out some top 64 action. As we walked, Menno asked me if there was anyone that I wanted to meet and I told him that I’d really like to shake Mike Ross’ hand and maybe get a picture with him. See, I had in my mind that for whatever reason, I should just let the pros be, but Menno assured me that they love talking to other players. So we talked to them. We talked to a lot of them. We talked to Ricky Ortiz, Gootecks, and Maximillian. We thanked Ono for all that he does to help make these games a reality. We spent a solid twenty minutes talking to Keits about Dive Kick, then I got to play it for the first time ever with Keits coaching me. That evening I became something greater that just a stream monster. That evening, I became a true member of the FGC. That evening I started to plan for Evo 2014. This concludes part one of my two (maybe three?) 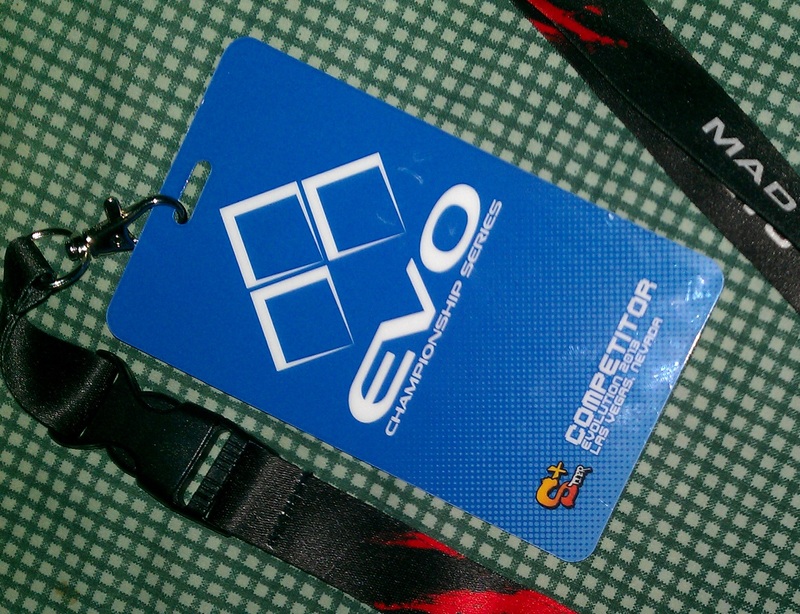 part series on Evo 2013! Check back tomorrow for a very special video segment which includes all of my Street Fighter pools matches! “Weekly Vortex Episode 1: A Farewell to Scorpion” is Now Live! As promised, here’s my first scheduled post! I have decided to move from the short-lived beta numbering of my previous “Kunai Vortex Online” videos as I seem to have a decent grasp on how to use my equipment now, so I’m effectively ‘out of beta.’ This doesn’t mean that I’m done improving my video presentation, but until I get some more editing practice under my belt, the basics will do just fine. I’m also open to suggestions on the name of my weekly series, as I’m not completely in love with this one. Now, let’s talk about some Injustice! 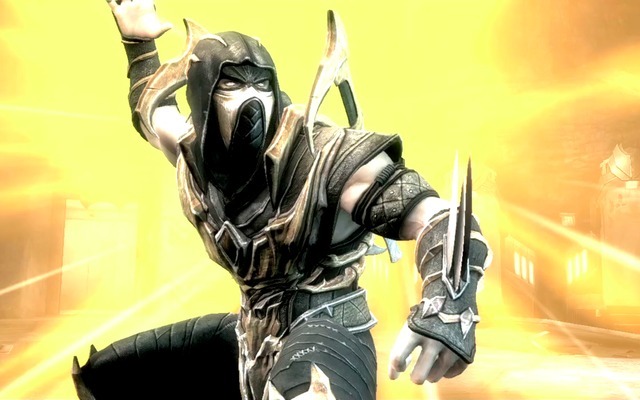 When I decided to play Scorpion, I intended to learn his vortex first and focus on his neutral game later. The vortex isn’t all that complicated; any time a grounded Teleport Punch lands, he gains a hefty 25 frame advantage which allows him to either go for a low or an overhead (risky), or a free Hellfire. Since the vortex begins so easily and can start off of any knockdown, I go for a whole lot more sweeps than I probably should. Instead of punishing whiffs and unsafe strings with a real combo, I punish with a sweep. This delivers very little damage, but does allow me to begin my vortex if my downed opponent guesses incorrectly. The justification here is that I played these ranked sessions to work on my vortex and vortex setups. No super flashy combos, no super hype neutral game (in fact, there’s little neutral game at all), just vortex. That’s why I decided to toss a couple of particularly ridiculous rounds on this reel just to show how great it looks when someone takes almost no damage outside of the vortex. Sadly, as I stated in my post earlier this week, I believe that Scorpion deserves to be banned from tournament play until his Teleport Punch can be corrected to no longer undermine basic game mechanics. There are multiple instances of me using it to do just that throughout this week’s video. On several occasions–the Wonder Woman match comes to mind–I use the move to dodge a tossed or soon-to-be tossed interactive object and punish with a full combo that leads into vortex. So unless the coming update which boasts more small Scorpion adjustments proves to alter the move to a more suitable state, I will be dropping the character for Evo. That doesn’t mean that I won’t still play him in ranked or casuals from time to time, but were I to make it out of pools with Scorpion, I’d feel my gains ill-gotten. Plus Hal Jordan has enough willpower to deliver me safely to victory. Maybe. Of Matchups and Banhammers: Should Scorpion Be Banned? I think we are jumping the gun on this. Is Scorp cheap? No doubt. Does he break the pace and rules of the game? Obviously. Is he broken? Maybe. Should we ban him because nobody likes playing against him and Reo bodied a handful of players on a stream? No. He is a high mobility low damage character. I’ve made this point in another thread, but this concept isn’t foreign to fighting games. I’ll give a clear example. Super Turbo Vega is undoubtedly one of the ‘cheapest’ character[s] in ST. He doesn’t play by any of the rules. Zoning him is out of the question because of [how fast his wall dive is]. He’s hard to anti air because he’s got the fastest jump in the game and his jumping fierce can beat even some anti airs. He has a flip kick which is [a] good anti air and a good reversal. He has a vortex to where if it hits, you could guess wrong until you die. Sound familiar? Yet we don’t see the Capcom players banning Vega. They all agreed the character plays by his own set of rules and everyone will have to learn how to fight against him. While this tech may prove useful in the future, should the ninja not be banned, let’s consider what makes something “ban worthy.” Regardless of what game, or even what genre of game in which two parties intend to compete, exactly what makes a character, stage, or tactic worthy of a ban remains unchanged: it must undermine the essence of the game. Video games are unique in the realm of competition in that they don’t have rules in the same way that sports have rules. Nowhere does there exist a massive tome of exactly what rules apply to competitive video gaming, and such a tome can’t exist because the rules of video games are assumed to reside within the game itself. The “rules,” if they must be called that, are simply the mechanics of the game in question. These mechanics are literally programmed into the game and allow it to run as it does and, therefore, cannot be broken. Exceptions to these mechanics would be some sort of glitch, but even Marvel vs. Capcom 3‘s DHC glitch remained a “fair tactic” until it was made obsolete by a quickly-released Ultimate version of the game that fixed the issue. So in order to be worthy of a ban, the character, stage or tactic must directly interfere with the intention of the game’s mechanics. For such a judgment to be made, we must consider what the developers of the game intended when designing it for consumption by the hungry masses. This is where things begin to blur, but in specific instances clear-enough lines can be drawn to help us figure out the developers’ intent. Since Scorpion inspired me to pen this article, let Injustice be the example to further explain the point at which I’m getting. When the fellows at NetherRealm sat down at their collective desks and began to design this game, they had in mind something that worked as an amalgamation of all the things they’d developed before–a magnum opus of violence and flashy graphics. Previous titles involved the destruction of background items and the knocking of ragdolled bodies through roofs and walls for the purpose of aesthetics. After all, It ‘s rather satisfying to hit your opponents so hard that their bent bodies break through stone and metal, causing a crash of debris to erupt over the fighting arena as you move in for your next blow. Pretty though it may have been, these stage transitions and blown-apart statues meant very little when it came to actual game play, so the creative powers that be called for a change. As a result of their new design philosophy, we now have interactive objects that can be torn from the walls and ceilings and tossed to cause beautiful bodily harm to our opponents and we have stages that swap back and forth as players slam tightly-curled fists into one another. Wrap a cape around it, slap a mask on it and you’ve got the basic framework for Injustice. So if the basic framework for a game revolves around the importance not only of character selection, but also stage selection with your character in mind, and we suddenly add to the mix a character that can circumvent most, if not all of the nuances that make each stage what it is, we have, gentle readers, the makings of something literally “game breaking.” Scorpion, quite simply, breaks the game. More specifically, Scorpion’s Teleport Punch breaks the game. Ignore his full screen, tracking unblockable; ignore the absurd hit box on his j.3; ignore the ridiculous active frames on his j.1; ignore his vortex; ignore the fact that he honestly doesn’t belong in a game dedicated to DC characters; instead, focus on the fact that if the Scorpion player anticipates the use of an interactive object–the very foundation of the game itself–he can Teleport Punch to dodge the flying generator-or-whatever, hit its thrower and follow with a full combo that leads into a vortex setup. Every other tool that Scorpion possesses merely makes him high tier. Tier placement shouldn’t dictate which character is or isn’t banned unless a character is so good that every tournament ends with a top 8 dominated by that character, and even then, one should be cautious and allow things to settle down a bit before jumping on the ban-wagon. It was only two short years ago, let us not forget, that an influx of Yun and Yang poured onto EVO streams. Even the mighty Daigo Umehara felt Yun so strong that he erred from his signature Ryu. Was it the divekick? Probably. The divekick was, and still is, even after nerfs, quite good. But it never actually stepped beyond the boundaries set by the Capcom developers at the game’s inception. The twins were an instance when a ban wasn’t necessary, the fights just sucked. They effectively ruined a year of EVO because such a vast number of players decided to switch from their cherished mains and move on to those always-delicious flavors of the month. Occasionally, the secret characters are the best in the game as in the game Marvel vs. Capcom 1. Big deal. That’s the way that game is. Live with it. But Super Turbo was the first version of Street Fighter to ever have a secret character: the untouchably good Akuma. Most characters in that game cannot beat Akuma. I don’t mean it’s a tough match–I mean they cannot ever, ever, ever, ever win. Akuma is “broken” in that his air fireball move is something the game simply wasn’t designed to handle. He is not merely the best character in the game, but is at least ten times better than other characters. This case is so extreme that all top players in America immediately realized that all tournaments would be Akuma vs. Akuma only, and so the character was banned with basically no debate and has been ever since. I believe this was the correct decision. So is Scorpion ten times better than the rest of the cast? Absolutely not. But he does have his Teleport Punch, which breaks the game in a manner similar to Akuma’s air fireball in ST. It pains me to say, as I have spent the last two weeks joyously training as Scorpion (and intending to main him at EVO), that we are left with two real choices: drastically alter/remove Teleport Punch–likely at the cost of removing his vortex game–or leave Teleport Punch as it is and ban Scorpion. Regardless of what ends up happening, even if he remains legal at EVO 2013, I now have a moral obligation to play someone else; perhaps Green Lantern and I will make it out of pools. Posted in Fighting, Gaming. Tagged Banhammer, Character Selection, EVO 2k13, EVO2k, Games, Gaming, Injustice: Gods Among Us, Mortal Kombat, NetherRealms, Scorpion, Toasty!